I first encountered the name S.W. Erdnase at random. A former colleague turned out, under questioning, to be a fairly serious amateur prestidigitator; he told me about a book called the Expert at the Card Table, from which he had learned almost everything he knew about legerdemain. He told me, as well, that no-one really knew who the author was. Sam Munson's The War Against the Assholes is available from Amazon. Copyright 2015 by Sam Munson. Published by Saga Books, a Division of Simon & Schuster, Inc. 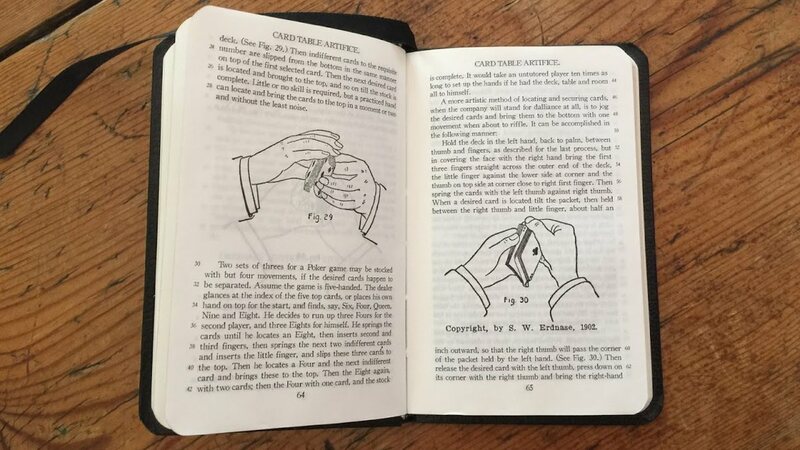 It is not surprising that the book has become in the ensuing hundred and thirteen years a vademecum for magicians amateur and professional alike (some are quite literally able to cite it from memory, chapter and verse). For attached to its internal excellence is a mystery. And his (an assumption) audience, his true constituency, comprises primarily magicians, people who by their very nature cannot help probing and driving to the technical and philosophical hearts of amazements and obscurities. The suspects Erdnase’s pursuers have unearthed are numerous. Mostly men of small and questionable reputation, a few successful professional magicians, and at least one killer: Milton Andrews, a con artist who died in a sordid suicide in California. The Milton Andrews theory, devised by legendary recreational mathematician, Lewis Carroll expert, and enemy of pseudoscience Martin Gardner (who, it has always seemed to me, must stand as a tutelary spirit to this publication) is now regarded as wide of the mark. But the genus Andrews has provided a number of candidates (it can be found, reversed, in the first seven letters of the pseudonym, as I am sure many of you reading have already observed). James Andrews, a New Yorker making his living as a fortune-teller. Hebert Andrews, who operated a business near the publishing house that printed The Expert at the Card Table. E.S. Andrews, who was either a penny-ante Midwestern con artist, a riverboat captain, a publisher himself, a British engineer and recreational math geek (like Gardner), or a railroad man traveling the great and now defunct Chicago and Northwestern. Genii Magazine, perhaps the magic world’s leading publication, lent a significant amount of space in the fall of 2011 to the Erdnase theory developed and advanced by David Alexander, a West Coast magician and private detective. Alexander had come to the conclusion that Erdnase was not a petty criminal or a passionate eccentric but a well-established and well-educated mining engineer named Wilbur Edgerton Sanders. His evidence, though circumstantial, was compelling enough both for Genii and the Wall Street Journal and BBC. There is a powerful literary satisfaction to be derived from Alexander’s theory -- Erdnase living a double life, as solid burgher and cardsharp, playing a nimble and nihilistic game with identity. For a master theoretician of deception, such a life would be almost a requirement (and a tale worthy of inclusion on Borges’s A Universal History of Infamy). Alexander died during a maintenance check-in on a rental property he owned. He was found in a pool of water from a burst attic pipe, victim of an apparent heart attack. A violent instantiation of the entropy Erdnase struggled against: all card manipulators are, ipso facto, warriors against disorder. Given the continuing and impenetrable perfection of his greatest sleight, Erdnase -- whoever he was -- seems to be at least for the moment victorious. The Expert at The Card Table - Erdnase (HD) from Michael Stern on Vimeo.